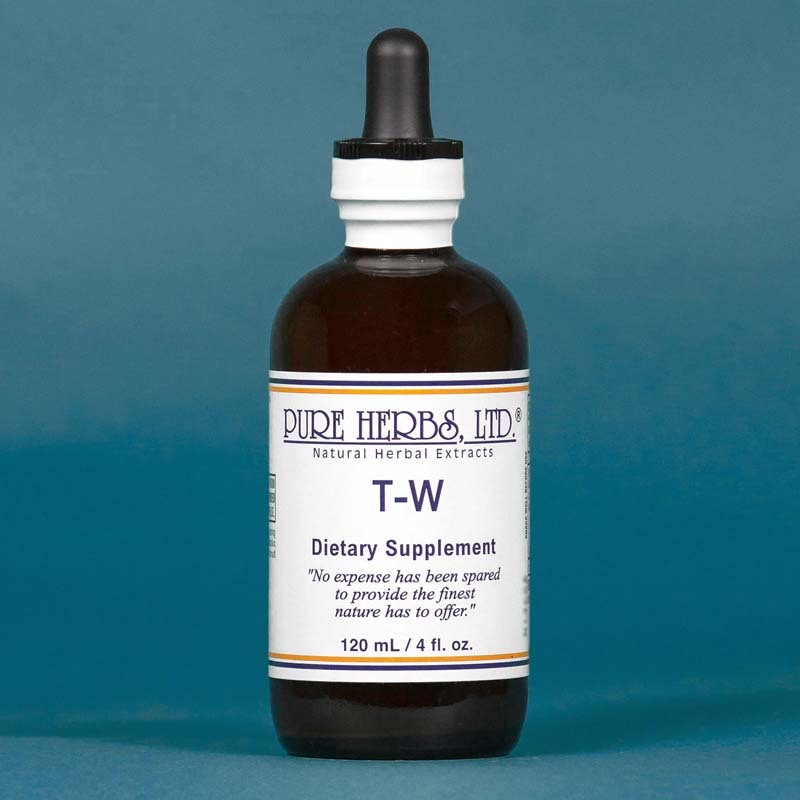 T- W (Thyroid) - Organic, natural iodine and more for the thyroid. The thyroid is a large gland with the appearance of a bunch of flattened grapes which sets at the base of the neck under the voice box. Here is the sub-station in control of blood calcium levels and calm nerves, strong nails, weight control, energy, hair that does not break off and healthy skin. When the thyroid is properly nourished, hands and feet warm up and fibroid tumors are prevented and/or reabsorbed. Remember, not just the thyroid requires a high grade natural source of iodine, the ovaries store iodine also for their proper health. The thyroid, however, is a "hog" and takes its iodine first. If there is not enough for both, or either, the thyroid takes it all and thus, fibroid tumors occur. If the thyroid does not get enough nutrients it may swell in size in an attempt to absorb more by getting bigger. The base of the neck may become fat and or the thyroid may enlarge internally (goiter). This is a common cause of feeling like there is always something in the throat that can not be swallowed. If the chemical iodine added to salt actually worked, with all the salt in the typical diet, there would be no problems as listed here. White salt is refined salt, which is another way of saying it has been robbed of every thing except sodium and chlorine and chemical iodine which may be added to it. If a person has a "taste" for salt, then assume they are mineral deficient and lacking the assortment of the many true mineral salts which should be in the body and would be found in unrefined salt. Much better than unrefined salt, would be to take the mineral salts from the living lattice of sea vegetables which have them organized in a form to support life. With that in mind, we take either V.M.-W (Vital Minerals), T-W or A.C.S. (All Cells "Salts" minerals) for a balanced mineral profile. Most so-called "weight loss diets" do not result in weight loss because they do not address proper thyroid nutrition and thus regulate the speed at which food is burned and energy is released. You may also find, with proper thyroid nutrition, the fingers no longer shake when the arms and hands are extended and the fingers spread apart; as well as strange fears that simply disappear. * COMBINATION:Dulse, Bladderwrack, Wild Lettuce, Irish Moss. DOSE:10 to 40 drops, 3 times per day. In cases of severe depletion, then 40 to 80 drops, 3 times per day. If you feel "nervous" after taking, simply reduce the amount and the feeling will go away shortly. If you feel nothing, gradually increase the amount until you do feel more energy. Note: T-W can be applied externally to the base of the neck under the voice box, if desired, rather than taking it internally. You may have to use a little more than would be the case for internal use. Apply externally 3 times per day. If very sensitive skin, apply Vitamin E from 100 i.u. capsules first. Flakes are a normal occurrence.